As one of the most popular programming languages in use today, Java can help you design scalable, high-performance applications. 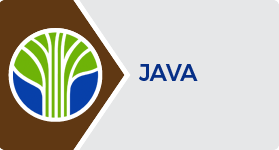 Learning Tree is proud to offer the following Java Programming Specialist & Expert Certifications, so you can validate your Java programming skills. As a Certified Specialist in Java Programming, you have the skills needed to employ best practices to rapidly build reliable and scalable Java applications. You will effectively apply Test Driven Development to enhance program maintainability, solve architectural problems with proven design patterns, and write robust threaded applications and avoid concurrency hazards. As a Certified Specialist in Java Web Development, you will integrate key components of Java EE to generate dynamic web pages, personalize content for users and build console and GUI applications. As a Certified Expert in Java Programming, you have demonstrated the ability to build reliable and scalable Java applications as well as effectively apply Test Driven Development. You have expertise using Java Enterprise Edition to implement high-performing, scalable and secure transactional applications. As a Certified Expert in Java Web Development, you have a prowess in generating dynamic Web pages, personalizing content for users and building console and GUI applications. You have competencies in designing and building Web services using Java.